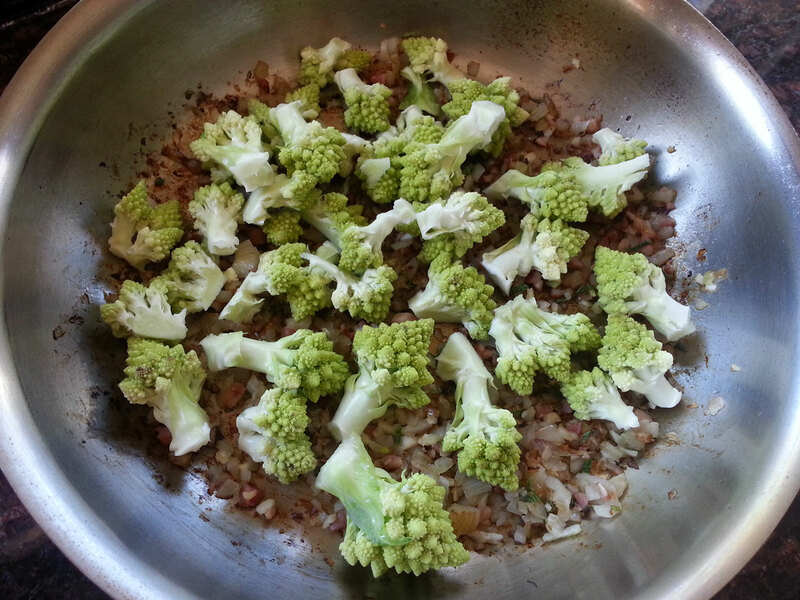 The first time I saw Romanesco cauliflower, I was not in Rome. I was at a farmer’s market in New York City, and the subtle green vegetable made me stop in my tracks: it looked like an alien from a science fiction film, or something out of an Arcimboldo painting. It had a striking shape, with conical florets spiraling towards a pointed top. When I asked the vendor about it, she said it was Roman broccoli (another name for it). 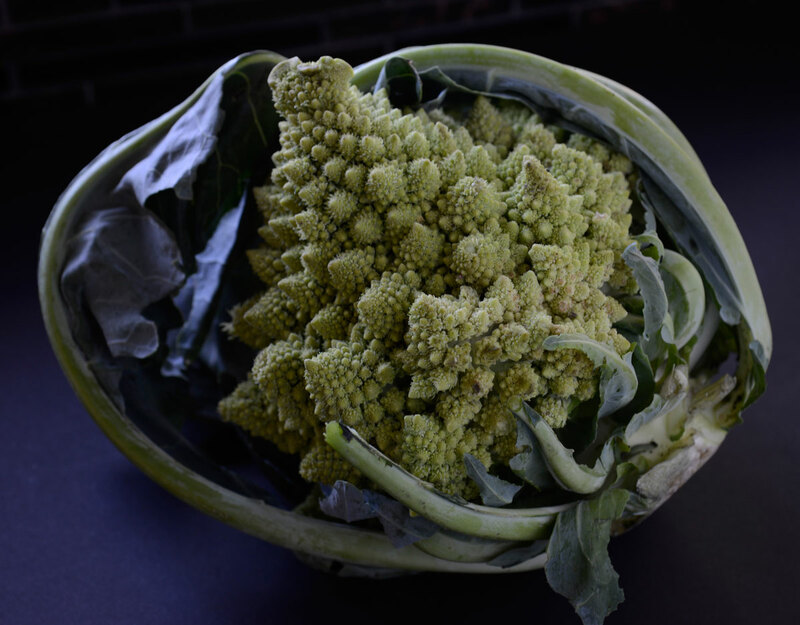 Needless to say, that day I bought and cooked my first Romanesco cauliflower; and every time I have spotted any at the farmers’ markets, I never passed up a chance to pick one up. 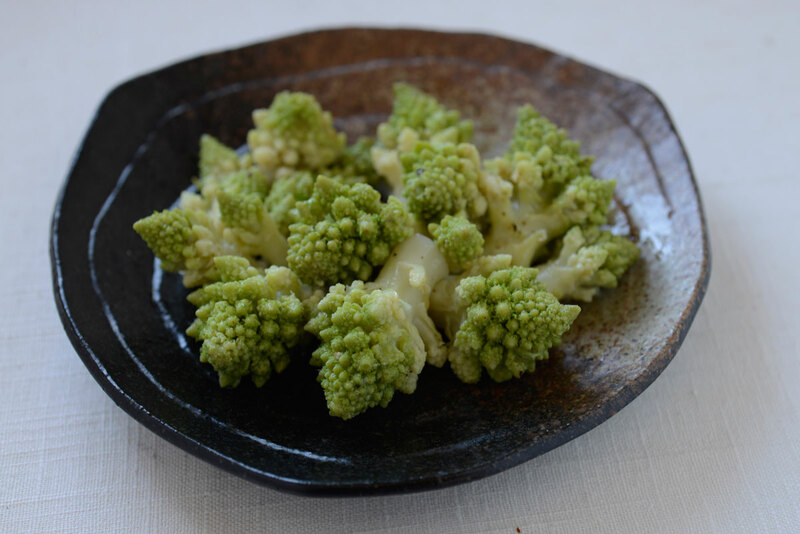 The flavor of Romanesco is a bit nuttier, sweeter, and more subtle than that of regular cauliflower, so I tend to like it best in simple preparations that don’t mask its nuanced flavor or its unusual shape. 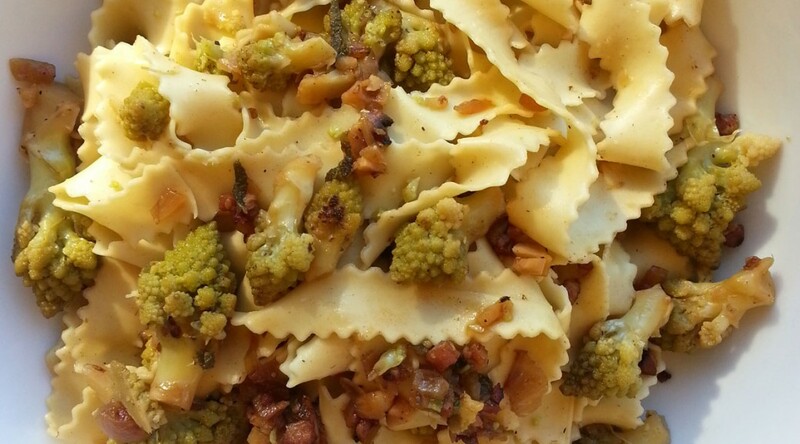 The recipe below can certainly be made with regular cauliflower if Romanesco is not available. Make the sauce: Place 1 tablespoon of the olive oil, the shallot, garlic, sage, and bacon in a skillet large enough to accommodate the pasta later. Set the skillet over medium heat. Cook 5 minutes, stirring often, or until the shallots are fragrant and the bacon has lost its raw smell. 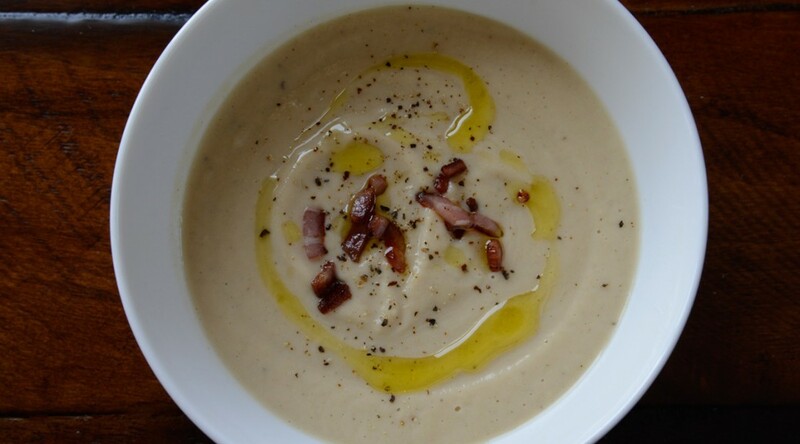 Add the cauliflower florets, season with 1/2 teaspoon of the salt, and cook, stirring often, until the cauliflower is limp and lightly browned in spots, about 10 minutes, adding a bit of water by the 1/4 cup as needed to prevent the cauliflower from burning or drying out. Meanwhile, bring 3 quarts of water to a boil. When the sauce is ready, add the pasta and the remaining 2 tablespoons of salt to the boiling water, and cook until al dente, about 1 minute. Drain, reserving 1 and 1/2 cups of the pasta cooking water. 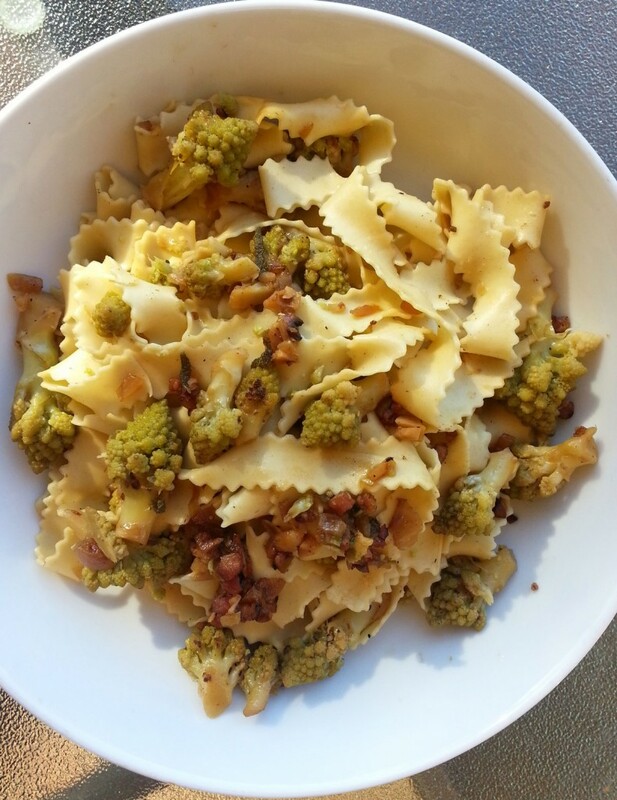 Transfer the pasta to the skillet and saute over high heat to combine the flavors. Stir in 1/2 cup of the reserved pasta cooking water, the remaining 2 tablespoons of olive oil, the Parmigiano, and the pepper. Adjust the salt if necessary, and add a little more of the reserved cooking water if the pasta seems too dry. Serve hot.